[Extract from 1912 book] LEICESTER: SANITATION versus VACCINATION BY J.T. BIGGS J.P.
CHAPTER 105: Anti-Toxin and Diphtheria. CHAPTER 106: Continental and American Evidence Against Anti-Toxin. CHAPTER 107: London Evidence Against Anti-Toxin. CHAPTER 108: Evidence from the Registrar-General Against Anti-Toxin. CHAPTER 109: Leicester's Evidence Against Anti-Toxin. CHAPTER 110: What is Anti-Toxin? Inoculation and vaccination for small-pox have brought in their train a succession of inoculation theories. The practice has now become so widespread that it may veritably be described as a "mania." It is, therefore, only a natural corollary for this subject to be referred to here. Especially is this the case when these theories are utilised to bolster up the practice of vaccination. Prom the time when Benjamin Jesty first performed vaccination in 1774 — a discovery erroneously attributed to and appropriated by Jenner—there has been a frequent recurrence of alleged "discoveries" in the seratherapeutic world. Indeed, we have recently been informed, upon the supposed highest scientific authority, that it is in this direction we must look for future triumphs of preventive medicine. A dismal, rather than a hopeful, outlook for humanity ! Amongst the various ghastly failures of seratherapy which have obscured the true art of healing, none have been more prominently advertised than the now discredited canine inoculations by Pasteur for hydrophobia. Others of almost equal notoriety and fatality have been Koch's tuberculin serum for phthisis, Haffkine's and Yersin's sera for the plague ; cholera virus ; enteric (typhoid fever) serum, and anti-toxin serum (now so widely used) for diphtheria.
" It is the fact that numbers of the rank and file have had their health utterly ruined as a direct result of the inoculation" (for enteric). What an enormous additional amount these inoculations must have added to the cost of the war, by disabling so many of our troops, when their services were most needed! The number of strong and healthy young officers, going out on board our troopships, who fainted on being thus inoculated was extraordinary. Sir T. Lauder Brunton, M.D., says (Question No. 7,131, Royal Commission on Vivisection) that in certain cases, "instead of getting simple syncope, they got fatal syncope." It is not my intention to refer to the incontrovertible evidence accumulating against these "cultures" in general, but to limit present observations to diphtheria. Now that the prevalence and fatality of diphtheria are attracting some attention, it may not be inopportune to review the teaching and statistics of the past, for the purpose of elucidating, as far as possible, the facts which relate to the treatment of this malady. The majority of the medical profession— particularly since 1894—have pinned their faith to anti-toxic serum as a cure and a remedy, especially if applied at an early period of the disease. If the results were as beneficial as they are so boldly and unblushingly asserted to be, then I candidly admit it would be a thankless, difficult, and almost insuperable task to convince anyone, either of the inutility, the total failure, or the positive danger of the use of anti-toxin. Before I conclude, I hope to prove all three of these contentions, and to show that since anti­toxin was introduced, where diphtheria has decreased, such decrease has not been due to anti-toxin, but is merely the continuation of a decline which had already set in prior to the invention of this new remedy, thus conforming to a general law—already in operation before anti-toxin serum was known. In some places, this decline has been arrested ; in others, diphtheria has not only largely increased, but has become more seriously fatal since the advent of anti-diphtheritic serum. It is common knowledge that diphtheria and its fatality had not only decreased, but were declining in Europe long before 1894, the year of the introduction of the equine diphtheritic serum. This decrease of fatality was largely due to improving sanitary conditions; but the most important factor contributing to the ostensibly lessened fatality (if any), since anti-toxin came on the scene, is not due to anti-toxin, but to the inclusion of a large number of cases, principally children, simply suffering from " benign sore throat," and not from diphtheria at all. The treatment of diphtheria with anti-toxin serum rests its claim upon Loffler's hitherto unproved theory, that a certain bacillus is the active origin of the disease. But as this bacillus has often been found in the throats of numerous perfectly healthy persons; and, on the other hand, has been absent in a large percentage of diphtheritic cases ; the evidence upon which the treatment is based is not only inconclusive, but contradictory. Whether the theory be based upon truly scientific principles or not, may, however, be disregarded for the present while we examine the actual results. It will not be difficult to prove that the decline in the fatality of diphtheria is in no way due to anti-toxin. The anti-toxin treatment of diphtheria became general in 1895, and has continued practically without abatement. Over­whelming evidences of its failure may be adduced, but I purpose citing a few instances only. Just as the decline in small-pox preceded the introduction of vaccination (see Farr on London "Vital Statistics"), so the decline in the fatality of diphtheria had set in years before the use of anti-toxin. Professor Soerensen says, in the " Practitioner," April, 1896, "that the serum did not, to any appreciable degree, prevent the extension of the disease to the larynx; all the severe cases died, and the good result in the lighter ones was attributable to the mild type of the epidemic." He also states that, at the Hospital of Bligdam, Copenhagen, "the mortality from diphtheria remains the same after, as it was before" seratherapy was introduced. Professor Bassowitz notices " that deaths from diphtheria have declined in Vienna where the serum is in general use, but he also remarks that they have equally decreased in Lower Austria, where the serum has not been employed." Dr. Joseph Winters, Professor of Diseases of Children at New York University, has published a book on "Clinical Observations upon the Use of Anti-Toxin in Diphtheria," in which he exhaustively discusses the whole treatment and its results, and, referring to the statistics brought forward in favour of the anti-toxin treatment, says that "percentage of mortality is not only misleading, but is absolutely worthless unless accompanied by the actual number of cases reported and the actual number of deaths." He also declares that "the serum has an injurious effect, and will certainly be abandoned." " In Baltimore, Philadelphia, Boston, and New York, the deaths from diphtheria show a decided increase, comparing the years before and after the use of anti-toxin," the mortality varying, according only to the gravity of the disease. Dr. W. R. Hadwen, J.P., in his pamphlet on " The Anti-Toxin Treatment of Diphtheria: In Theory and Practice," states that at Berlin, in 1895, the fatality-rate from diphtheria was 15.7 per cent. The next year, 1896, the fatality-rate fell to 12.3 per cent. This decrease was forthwith hailed as a great triumph for anti-toxin. But, alas, for human credulity ! Not withstanding the use of the serum, the fatality-rate rose in regular progression until in 1900 it had reached 17.2 per cent. Dr. Hadwen gives a list of towns where sudden decreases in the death-rate from diphtheria occurred prior to 1894—namely, Berlin, Berne, Brussels, Christiania, Leipzig, Lyons, and Rome. He also gives a list of towns where the maximum mortality was reached long before 1894—namely, Buda-Pesth, Buenos Ayres, Copenhagen, Geneva, Hamburg, Havre, Munich, Paris,. Stuttgart, Toulouse, and Turin. He further gives the names of towns where the deaths from diphtheria have risen since 1894—Bucharest, Dublin, Liver­pool, Stockholm, and others. In St. Petersburg, there were 579 deaths from diphtheria in the three years 1892-94, before anti­toxin was introduced. Since the use of anti-toxin, these have increased to 1,276. Dr. Stephen Smith, in " Fruitless Experiment," gives a list of authorities and places showing the increased number of diphtheria deaths since the advent of anti-toxin. Amongst these are Amsterdam, Basle, Boston, Brooklyn, New York, Prague, Potsdam, Trieste, and Vienna. In Berlin, the records of the Charite Hospital show, since 1894, "an increase year by year in the mortality from diphtheria, as a result of the anti-toxin treatment, notwithstanding the fact that a large percentage of the cases had the disease in a mild form." The number of children treated for diphtheria has trebled since the application of serum. As an example of the dangerous nature of the poison, Dr. Langerhaus, of Berlin, inoculated his boy, aged one year and nine months, with anti­toxin serum, as "a precautionary measure, a maid-servant having been sent to the hospital with symptoms of diphtheria." The "Times," of 12th April, 1896, states that "a few minutes after the operation, which the unfortunate father himself performed, the child, who was before in blooming health, was dead." " Dr. Langerhaus himself is, apparently, of opinion that the anti­toxin was the immediate cause of death." It would, indeed, be strange if he had thought otherwise. Dr. De Maurans tells us, in the weekly bulletins of the Statistical Department of the City of Paris, that, in 1895, the diphtheritic fatality was only 9.42 per cent, in Paris. Six years later, when the anti-toxin treatment was in full swing, the fatality had risen to 14.49 per cent., thus showing an enormous increase. The Metropolitan Asylums Board of London exercises its functions over probably the largest area and population, and deals with the largest number of cases, of any authority in the world. The authoritative official reports of this Board carry great weight, and may be regarded as conclusive. Especially is this the case when the evidence they afford is contrary to that which the compilers would have wished to present. The following figures are abstracted from the tables contained in the annual reports of the above Board from 1895 to 1910. The most striking and dominant feature of the table is the high fatality-rate of those inoculated with anti-toxin when compared with the untreated cases. The highest fatality-rate of the injected patients is 28.1, and the lowest 9 per cent., whereas the highest fatality of the untreated cases is but 13.4, and the lowest only 1.5 per1, cent., showing a difference enormously against the use of anti-toxin. The fatality of the treated cases is more than double that of those not treated with this dangerous concoction. Shown in Four-Year Periods, 1895-1910. Fatality per cent, of Cases treated with Antitoxin, including mild cases and simple sore throat oases. Average annual fatality, 13.28 per cent. Fatality per cent, of Cases not treated, but including (137) 17 per cent, of moribund cases, and (92) 12 per cent, of diseases other than Diphtheria. Average annual fatality, 5.65 per cent. Deducting moribund cases and deaths from other diseases, only 3.9 per cent. TABLE 36. (See Diagram E.) Metropolitan Asylums Board Annual Reports. Summaries of Anti-Toxin Treatment of Diphtheria from Medical Supplements. Fatality of anti-toxin cases ■■■■■■■■ 13.28 per cent. Fatality of non-treated cases ■■■ 5.65 per cent. Relative Difference in favour of non-treated cases nearly 58 per cent. Total cases, 88,445 ; total deaths, 10,837 ; fatality rate, over all, 12.25 per cent. It will be seen from the foregoing table that 75,310 cases of diphtheria were treated with anti­toxin, with an average fatality-rate of 13.28 per cent. ; and that 13,135 cases not so treated yielded an average fatality-rate of only 5.65 per cent.—a relative difference of nearly 58 per cent, in favour of the latter, and hence damaging to the claims made by the advocates of anti-toxin. But this is not all. From foot-notes to the tables in the reports, we find that of the 742 deaths in cases not treated, no fewer than 137 were moribund, and recovery hopeless on their admission to the hospitals, while there were at least 92 deaths from diseases other than diphtheria. This proves that low as was the average fatality-rate of the cases not treated with anti-toxin, it is also unfairly saddled with all the worst and absolutely hopeless cases. In addition, a number of deaths from other causes which ought in common fair­ness to have been excluded are actually included in the non-treated class, the elimination of which would have led to a further reduction of the non-treated fatality-rate. It is, therefore, futile to contend that the group of cases treated with anti-toxin contained a larger proportion of severe cases. The tables all prove the very opposite. If the 137 moribund cases are deducted from the 742 non-treated deaths, the fatality rate of this class is reduced to 4.66 per cent. ; and if the 92 deaths from other causes are also deducted, as they should in all fairness be, then the fatality-rate is reduced to only 3.9 per cent., against 13.28 per cent, for the serum-treated cases. Comparing relative percentages, this shows an advantage of over 70 per cent, in favour of the non-treated cases. Now it is perfectly well known and established that the very essence of the treatment of diphtheria by anti-toxin is to secure the patients at the earliest moment—on the first day of infection if possible. It is argued that in the early stages of the disease, the diphtheritic poison is more amenable to the antidotal treatment by serum. Elaborate figures have been compiled by Dr. MacGombie (Medical Superintendent of the M.A.B. Brook Hospital) to show that in those injected with anti-toxin on the first day of infection, the fatality was nil ; on the second day, it was 4.5 per cent. ; on the third day, 11.9 per cent. ; on the fourth day, 17.5 per cent. ; and on the fifth day and after, it was 18.9 per cent. On these figures one might argue, that the fatality is actually increased by the toxic poison, because in many of these cases the fatality is even higher than the average.
" To compare the mortality of those treated with anti-toxin with that of those which during the same period were not so treated would be to institute a comparison between two groups, one of which contained a very large and the other a very small proportion of severe cases. . . . And we are consequently led to express our deliberate opinion that to compare the mortality of the anti-toxin treated cases with that of those which during the same period were not so treated, as has been suggested, would not only be misleading, but also unfair." In other words, we are asked to disregard the evidence, and to believe that this result is due to the anti-toxin virus being applied only to severe cases, while the mild ones are not treated at all! ! A crushing answer to this assertion is supplied by the reports themselves. We need but remember that the whole, or principal, benefit of the treatment is alleged to depend upon the prompt, or very early application of the remedy before it is even known whether the cases will prove to be mild or severe, then the weakness of these excuses becomes palpable. I commend the foregoing facts to the thoughtful and intelligent consideration of all who desire to see the human race healthy, vigorous, and strong, both mentally and physically. The evils of zymotic maladies will never be succesfully com­bated by adding disease to disease. In fresh air, sunlight, and hygienic conditions must preferably be sought the remedy, which so-called scientific research fails to provide. While the devotees of seratherapy cling so tenaciously to these artificial, but dangerous, cultures from the bacteriological laboratories, no benefit from the "science of medicine " is destined to accrue to the human race. The Registrar-General's sixtieth annual report, pages 72-79, shows that in 1878 the diphtheria death-rate for England and Wales, per million living (before anti-toxin), was only 140, whereas in 1897 (after anti-toxin treatment began) the death-rate increased to 246, being a rise of 106 per million living. A comparison between Leicester, London, and England and Wales is given in the following table, from which it will be seen that the death-rate from diphtheria almost doubled with the advent in 1894 of the serum treatment. Table showing from 1868 to 1910, in quinquennial periods, the death-rate from Diphtheria, per million population, for Leicester, London, and England and Wales. It will be seen that a great rise in the diphtheria mortality took place in the quinquennia 1893-97 and 1898-1902, not only in Leicester, but also in London, and all over the country. It may be asked why was it so very fatal in Leicester ? As frequently happens, while more deaths occurred from diphtheria, there were fewer from other zymotic diseases, and these more than com­pensated for the increase from diphtheria.' This is clearly seen from Table 43 (Appendix), which shows a great decrease in the death-rate per million from the seven principal zymotics in Leicester. In 1893-97, the death-rate was 2,997 per million ; in 1898-1902, it was 2,831 ; in 1903-07, it fell to 1,654 ; and in 1908-10, it was only 1,153. The great rise was, therefore, a transfer of fatality from one zymotic to another, but this only more fully proves the uselessness of diphtheritic serum as a prophylactic. The anti-toxin treatment was general in 1895, the middle year of the period 1893-97. The death-rate from diphtheria in Leicester declined from 80 per million in the quinquennium 1838-42 to only 34 per million in 1848-52. It increased to 84 per million in 1868-72, the period of high vaccination. In 1888-92, it had again gone down to 72 per million, but, with the introduction of anti­toxin, the death-rate was nearly trebled the next five years. Even in 1908-10, it was considerably more than the death-rate of 1848-52, so what benefit has Leicester gained from the use of anti-toxin ? London, with the use of anti-toxin, but in spite of all its sanitary advancement, has a higher death-rate from diphtheria by 18 per million in 1908-10 than it had in 1868-72. England and Wales, notwithstanding the enormous strides made in the improvement of the public health, and the lessening death-rate, has a higher population death-rate from diphtheria by 26 per million in 1908-10 with anti-toxin than in 1868-72 without. Where, then, is the advantage derived from the use of this virus ? It is of no avail to say the fatality of cases is less, as this is fully accounted for by the inclusion of many cases of ordinary " sore throat," under the nomen­clature of diphtheria. The statistics already furnished (collated from various sources) comprise a sweeping condemnation of the use of anti-toxin, but Leicester people will be anxious to know whether the results in their own borough coincide with the teaching of other towns and countries of the world. The evidence Leicester supplies is no less emphatic and conclusive as to the utter worthlessness of anti-toxin as a curative agent for diphtheria. Having prepared a number of statistics which have stood the test of a crucial examination before the Royal Commission on Vaccination, I am, fortunately, able to furnish the diphtheria figures for Leicester from the earliest complete year of registration—namely, 1838. Table 38 shows the total and annual average number of deaths, with the annual average death-rate per million living. Side by side with the various periods, I have entered notes of events which may affect both the cases and the mortality. 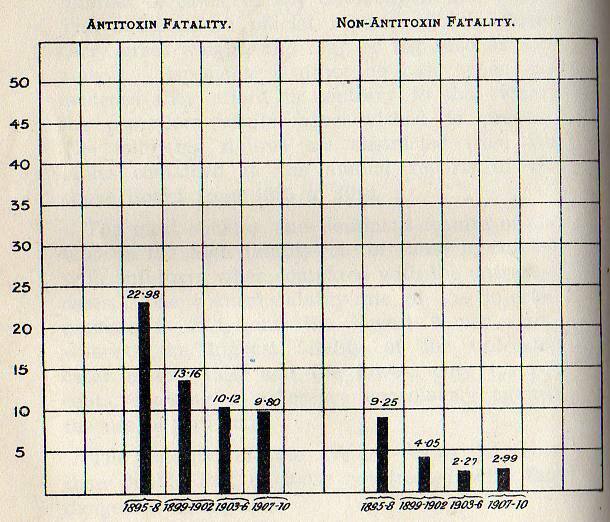 AVERAGE ANNUAL MORTALITY per million population, in quinquennial periods, before and after the introduction and use of antitoxin in 1895. Annual Average Death-Rate per Million Living. Anti-toxin treatment more com­pletely practised. Vaccination conscience clause of 1898 largely taken advantage of. From 1838 to 1858, deaths registered as putrid and other sore throats have been tabulated as Diphtheria.—J. T. B. This table shows that in the five years 1898-1902, when the serum treatment was in full swing, no fewer than 785 deaths occurred from diphtheria, being 452 more than took place during fifteen years previous to the introduction of anti-toxin, and 286 more than occurred during the preceding sixty years (three of which were not only anti­toxin years, but accounted for about one-third of the whole number of deaths in the sixty years). The death-rate from diphtheria was only an annual average of 33 per million living in Leicester in the years 1848-52 ; and the highest death-rate in pre-anti-toxin years was 92 per million, in 1878-82. After the serum treatment commenced, the death-rate went up to an annual average of 755 for 1898-1902, being 663 per million higher than in any previously recorded period of years. The highest death-rate for a single year in pre-anti-toxin times was 192 per million, and the lowest nothing. Anti-toxin years give a death-rate of 1,514 per million for the highest, and 27 per million for the lowest. Who, therefore, will venture to affirm that Leicester people have obtained any benefit from the use of anti-toxin ? Diphtheria had never been of very serious or fatal consequence in Leicester in the years preceding anti-toxin, but the number of cases and deaths went up by leaps and bounds when this virus was introduced. We may now consider what is erroneously regarded by medical men as a supreme test of the value of anti-toxin—i.e., the case fatality. There are no authentic records of the number of diphtheria cases in Leicester before 1880, so the case fatality-rate prior to that year cannot be ascertained. This is of no serious consequence, because comparatively few deaths were recorded before 1880 from this cause, the highest number in any one year being 11 in each of the years 1870 and 1879. Table showing, for the BOROUGH OF LEICESTER, during the years 1880 to 1910, the annual number of notified cases of Diphtheria and deaths; with the fatality per cent, and the same arranged quinquennially; with the annual average percentage of fatality. Annual Average Fatality per cent. 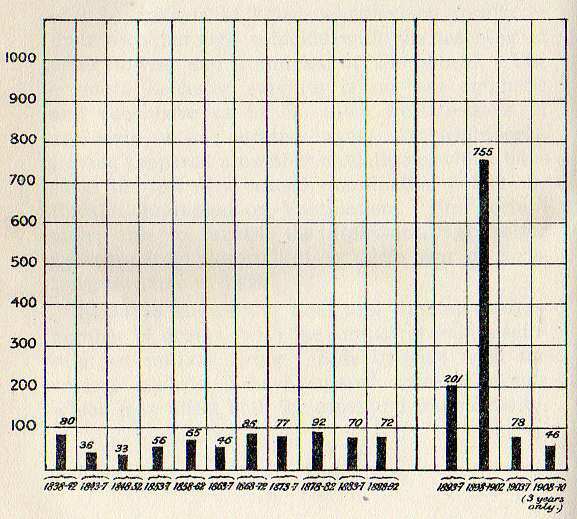 The above table gives the number of cases, the number of deaths, the case fatality, with the total number of cases and deaths in each quinquennium, and the annual average fatality-rate for each year, from 1880 to 1910 inclusive. It will be seen that a much larger number of deaths occurred in the anti-toxin periods, compared with the earlier ones, also that the case fatality for 1895-99 was about double that of the non-toxin years. Even when the case fatality was reduced to 13.1 from 1900 to 1904, what conceivable advantage could that be, when the cases were double any previously recorded number, and the deaths more than had ever been known ? TABLE 40. Before and After the Use of Anti-Toxin. 1895-1909, 15 years anti-toxin period. Here it will be seen that for the first fifteen years we had only 1,048 cases and 171 deaths, whereas in the second fifteen years, with all the increased advantages of sanitation, and up-to-date hospital accommodation, we had no less than 5,636 cases and 1,059 deaths. In the first period, the cases were less than 70 per annum, while in the anti-toxin period they rose to nearly 376, an increase of over 500 per cent. In the former period, the deaths from diphtheria averaged less than 12 each year, whilst in the anti-toxin period they reached over 70 per year, or the enormous increase of about 600 per cent. The anti-toxin case fatality is not only higher than the pre-anti-toxin case fatality, but the actual number of deaths shows it was more than six times as deadly. In other words, for one death in pre-serum years, no less than six occurred under the "benign" influence of anti-toxin. The fallacy of accepting case fatality as the one or only test of the supposed benefit of anti­toxin is further illustrated by Japan. The Serum Institute of Japan published a report, accompanied by a diagram, which was exhibited at the Japan-British Exhibition. Dr. M. R. Leverson has since published this diagram with the figures in "Inoculations and the Germ Theory of Disease," and it is from this I quote. In the seven years before anti-toxin, 1889-95, there were 30,039 cases and 16,571 deaths, or a case fatality-rate of 55.2. During the seven years after anti-toxin, 1896-1902, there were 112,588 cases, with 36,656 deaths, or a case fatality-rate of 32.6. Apparently there is an enormous saving by the reduction of the case fatality, but this is obtained by an increase of 82,549 cases and 20,085 deaths. In other words, since the introduction of anti-toxin in Japan, these deaths have more than doubled and the cases have nearly quadrupled !
" London in the fourteenth century was most interesting to the present generation as a study. In those old days London had the Black Death, from which one out of every two died." It is very curious how London, which is reputed to have lost one out of every two of its citizens by Black Death—the other half by the Plague—was decimated every few years by small-pox and a number of other epidemics, to say nothing of those who died a natural death, should have survived, and become the great and populous city as we know it to-day. It is a pity our public men do not acquire a more accurate knowledge of the history of our Empire city. The facts I have enumerated prove beyond contradiction that anti-toxin does not cure diphtheria ; that the number of cases and deaths from diphtheria have enormously increased since the anti-toxin treatment was adopted ; that it is a dangerous poison, uncertain in action, and uncontrollable in its results ; that it frequently sets up the very fermentation it is alleged to cure ; and that it is a failure as fatal and gruesome as Professor Koch's tuberculin, which, after a fortune-making but mortiferous career, was kicked unceremoniously aside for something new, even by the renowned inventor himself. A similar fate awaits the anti-toxin virus fraud, and the sooner it is overtaken by the Nemesis which is on its track, the better will it be for the health, happiness, and physical welfare of humanity. Statistically, whether as a cure or a remedy, anti-toxin (like all other inoculations) has not a leg to stand upon. It follows in the wake of a long series of delusions, with equally disastrous results to long-suffering humanity. There have been inoculations for small-pox, the plague, tetanus, tuberculosis, typhoid, snake venom, pneumonia, syphilis, yellow fever, leprosy, hydrophobia, erysipelas, and I know not what, until we have almost reached that glorious time, foreshadowed by Professor Tyndall, who fervently hoped and laboured for universal inoculation for all diseases. It must never be forgotten that incalculable pain, suffering, and cruelty to innumerable inoffensive animals is involved in every one of these inoculation experiments before they are ready to be offered to the public. Even then the text books which advertise these con­coctions utter words of warning as to the danger of their use, and emphatically impress upon practitioners that " the old medicinal treatment should not be neglected." What further comment is needed ! ! ! What is anti-toxin, and how is it obtained ? Some suppose it is a natural, heaven-sent product. In the forty-sixth volume of the Transactions of the London Pathological Society is a paper by Mr. W. Robertson, M.R.C.V.S., wherein he describes how he inoculated a horse, bought for a few pounds, with diphtheritic matter. The animal was treated week by week till he became what is called "immune." Then he was bled fourteen times, about 17 1/2 pints of blood being taken from him on each occasion. As blood on cooling becomes, half of it, serum, it follows that from this horse was procured 122 1/2 pints, or 61 1/4 quarts, of serum. Naturally, "the youngest, freshest, and most valuable horses are not used for this purpose." He reports the case of a horse in which the initial dose of toxine "produced a violent local and general reaction," and a second close a fortnight later "caused paralysis of the hind quarters, and the animal had to be destroyed." From this it is evident that "like" produces " like," rather than, according to the foolish serum theory, " like " cures " like." Dr. Bonnefin calculates that a horse, bled every ten days, yields two quarts of serum, which can be sold at £12 per quart, producing an income of about £800 per year, before the animal dies either from bleeding or infection. This, however, is nothing compared with the injury done to patients and the community. We find, then, that the process is to cultivate a portion of diphtheritic membrane, then to inject this poisonous matter into the blood stream of an animal; and when a feverish condition results, the animal's blood is supposed to be in a diphtheritic condition. The blood is then drawn off— with horrible tortures to the poor animal, unless it is slain. The blood coagulates, and the supernatant straw-coloured fluid is called serum. This serum is supposed to contain the diphtheritic toxin, and is ready to be injected into the bodies of human beings supposed to be suffering from diphtheria. Dr. Campbell Black, Professor of Physiology at Anderson's College, Glasgow, described anti­toxin as a filthy concoction of animal extracts, and said there was no finer advertisement for the modern medico-scientist than "to invent an anti-toxin from some animal abomination, and get it boomed as a cure for some new and grievous malady." This serum has never yet been proved to be a specific ; indeed, the facts are the other way. It is a dangerous proceeding at any time to inject a morbid fluid of this character into a human body. Changes in such a fluid take place rapidly, and it frequently becomes a potent power for evil, absolutely beyond control. It is administered on the happy-go-lucky, kill-or-cure principle. Probably the worst feature of all is the whole­sale diversion of true medical research from natural, into these unnatural, channels. Clinical studies are, in this way, abandoned for the more exciting and profitable incidents of the laboratory. How can this be remedied? The public have the solution of the problem in their own hands, and the best-class medical practitioners will be ranged alongside them, in refusing to have anything to do with these serum inoculations. The pathological aspect of this question is regarded as hallowed ground ; but even a "man in the street," as Mr. Balfour once observed, may sometimes possess knowledge equal to that of a Cabinet Minister. Although I lay no claim to special knowledge, nevertheless it is possible to collate the views of scientific minds. We are told that the " Loffler bacillus" is the cause of diphtheria. But is not the presence of the bacilli just as likely to be the effect as the cause. One thing is certain, the " Loffler bacillus" is found to be entirely absent in some cases of diphtheria, whilst it is present in other persons having no diphtheritic affection at all, and even in perfectly healthy persons. To say nothing of the large number of cases wrongly diagnosed, who unfortunately become victims of the anti-toxin craze, by having diphtheritic virus directly injected into their blood, there are the further large number who suffer certain sequelae as the result of this serum treatment. The seriousness of these may, to some extent, be approximately estimated by the reports of the Metropolitan Asylums Board, for in the year 1895 there were 1,804 of these untoward cases connected with anti-toxin, and in 1896 there were 1,738, or a total in the two years of 3,542. Dr. Washbourne, at a meeting of the Medical Society of London, on 9th October, 1899, pointed out that patients who died in spite of anti-toxin "treatment developed a certain train of symptoms suggestive of paralysis of the vagus nerve. "— "British Medical Journal," 14th October, 1899. In a series of experiments by Dr. Whitbridge Williams, in at least 75 per cent, of healthy persons the bacillus of typhoid, tetanus, diphtheria, and puerperal fever were found. The fact is, many of these minute creatures are "benign," and do not become "malign" until affected by the morbid poisons of these animal serums. Miss Lind-af-Hageby, in "Fallacies and Failures of Serum-Therapy," from " The Anti-Vivisection Review," quotes many authorities condemnatory of anti-toxin, and cites a number of deaths occurring from its use. Many of the quotations are from "ardent advocates" of serum-therapy. Miss Lind gives some excerpts from "Serums, Vaccines, and Toxins," by Drs. W. G. Bosanquet and J. W. H. Eyre, which show that amongst other sequelae from the use of serum are cyanosis, exudative tonsilitis, abscesses, cutaneous eruptions, erythema, urticaria, pyrexia, lockjaw, and other complications have occurred. Numerous instances of fatal injections of serum are given, and the forenamed doctors remark (1909 edition) :— "It cannot be denied that in a certain number of instances the injection of diphtherial anti-toxin has been followed by death directly attributable to the action of the serum." The observation of Dr. Hugo Magnus, in his "Superstition in Medicine," may well conclude this chapter:—"There can be no doubt that absurd superstitions are still existent for which the twentieth century will be severely criticised in time to come."